It has turned out to be a beautiful summer in the Rockies and we hope everyone has been enjoying it! Today we are sharing a beautiful Spring wedding from this year at Emerald Lake in Field, BC. The ice wasn't quite melted from the lake yet but the weather was still warm enough for a beautiful outdoor ceremony on the patio. Kari and Brent stood beneath a beautiful floral adorned arch overlooking the ice-covered waters and beautiful blue skies for the ceremony. They pronounced their vows to each other surrounded by incredible beauty and the love of those dearest to them. After the ceremony, everyone celebrated the new couple inside at Cilantro on the Lake. 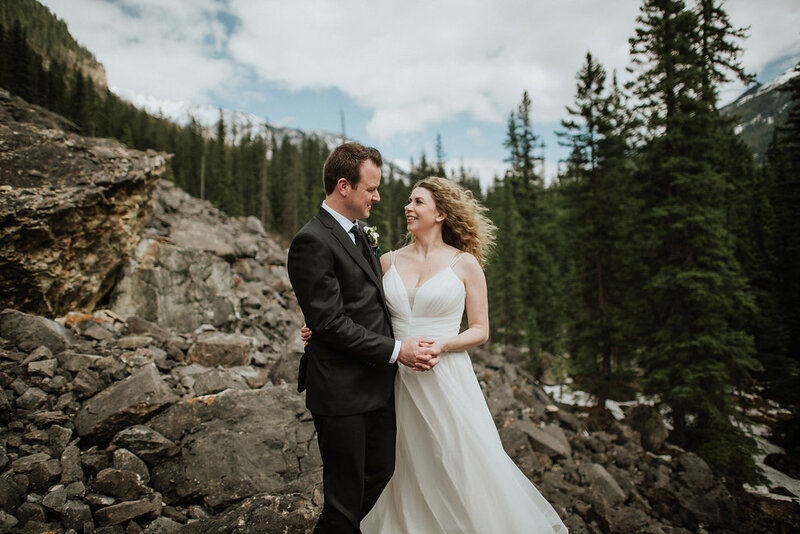 We love working at Emerald Lake and the beauty of this unique location, we had a wonderful time getting to know Kari and Brent as we helped them coordinate their wedding and worked on all of the florals and decor too. We loved working on this bouquet with Kari - the bouquet feels incredibly elegant with pink and white roses, but the touch of greenery and deep coloured accents give it the rustic touch it needed for their outdoor mountain wedding. The views everywhere you look are incredible here!! What a beautiful ceremony! The reception at Cilantro on the Lake was beautiful. We brought the arch from the ceremony inside to accent the front of the room and added many rustic touches amongst the beautiful flowers and greenery. The custom seating chart (above) is one of our favourite details and we loved how the same lettering was used throughout the name cards too.